1 A None No Power Seat 1 A is a standard Economy Class seat. Many enjoy the private feel of this seat, however the close proximity to the galley may be bothersome. The tray table is in the armrest, making the armrest immovable and slightly reducing the seat width. 11 A None No Power Seat 11 A may have limited recline due to the Exit Row behind. 11 B None No Power Seat 11 B may have limited recline due to the Exit Row behind. 11 C None No Power Seat 11 C may have limited recline due to the Exit Row behind. 12 A None No Power Seat 12 A is a standard Main Cabin Extra seat that has extra legroom due to the exit row in front. The window-side armrests are attached to the emergency exits and are smaller than standard which may be uncomfortable. 12 B None No Power Seat 12 B is a standard Main Cabin Extra seat that has extra legroom due to the exit row in front. The window-side armrests are attached to the emergency exits and are smaller than standard which may be uncomfortable. 12 C None No Power Seat 12 C is a standard Main Cabin Extra seat that has extra legroom due to the exit row in front. The window-side armrests are attached to the emergency exits and are smaller than standard which may be uncomfortable. 17 A None No Power Seat 17 A is an Economy Class seat that may be noisy due to the close proximity of the engine. This seat has no overhead bin storage and has restricted legroom due to the curvature of the plane. 17 B None No Power Seat 17 B is an Economy Class seat that might be noisy due to the close proximity of the engine. 17 C None No Power Seat 17 C is an Economy Class seat that may be noisy due to the close proximity of the engine. This seat has restricted legroom due to the curvature of the plane. 18 A None No Power Seat 18 A is a standard Economy Class seat in the last row of the plane. The proximity to the lavatory may be bothersome. 18 B None No Power Seat 18 B is a standard Economy Class seat in the last row of the plane. The proximity to the lavatory may be bothersome. 18 C None No Power Seat 18 C is a standard Economy Class seat in the last row of the plane. The proximity to the lavatory may be bothersome. 2 A None No Power Seat 2 A is a standard Economy Class seat however the close proximity to the galley may be bothersome. 3 A None No Power Seat 3 A is a standard Economy Class seat, however, the proximity to the galley may be bother some. 3 B None No Power Seat 3 B is a standard Economy Class seat with extra legroom. However, the tray table is in the armrest, making the armrest immovable and slightly reducing seat width. The proximity of the galley may be bothersome. 3 C None No Power Seat 3 C is a standard Economy Class seat with extra legroom. However, the tray table is in the armrest, making the armrest immovable and slightly reducing seat width. The proximity of the galley may be bothersome. This aircraft type is operated by American Eagle. This type is used on short-haul domestic segments and many passengers enjoy the 1-2 layout for comfort and personal space. Onboard storage is limited as there is only overhead storage on the right hand side. Standard rollaboard suitcases will not fit in these compartments and may need to be checked at the aircraft door. From time to time, passengers may be moved for weight and balance considerations. There is also limited under seat storage at all window seats due to the curvature of the fuselage. This is older plane but it's one of my favorite small RJ's because of the 1-2 setup. The single seats on the left side are comfortable for anyone under 6'2" or so. A standard rollaboard bag will need to be gate checked. On the whole this is more comfortable than a CRJ or a turboprop. Was late getting to the plane - my connecting flight was late, my luggage was late coming out of the carousel - had to abandon it and run. The gate was closed but plane still connected, they let me on. My original seat of 8A was occupied by someone else - weird. I was able to sit in 13B and was better off - no one beside me so I was able to stretch out. Lots of leg room. No food service though - just cookies. They should have at least had sandwiches for sale. No internet service or any entertainment on this flight. American Airlines approved PET CARRIERS DO NOT FIT under these seats! I just had to deplane my flight from SYR to PVD because my 19x13x9 American Airlines approved pet carrier didn't fit under ANY of the seats. Best seat on plane. At least a 40 inch pitch. Perfect for a 67 guy like me. The position of the bulkhead leaves limited legroom and no underseat storage. Great flight on a refurbished American Eagle/Piedmont Airlines ERJ-145. Seat was very comfortable with all new padding and window is much larger than the CRJ. Found no complaints at all with this aircraft. 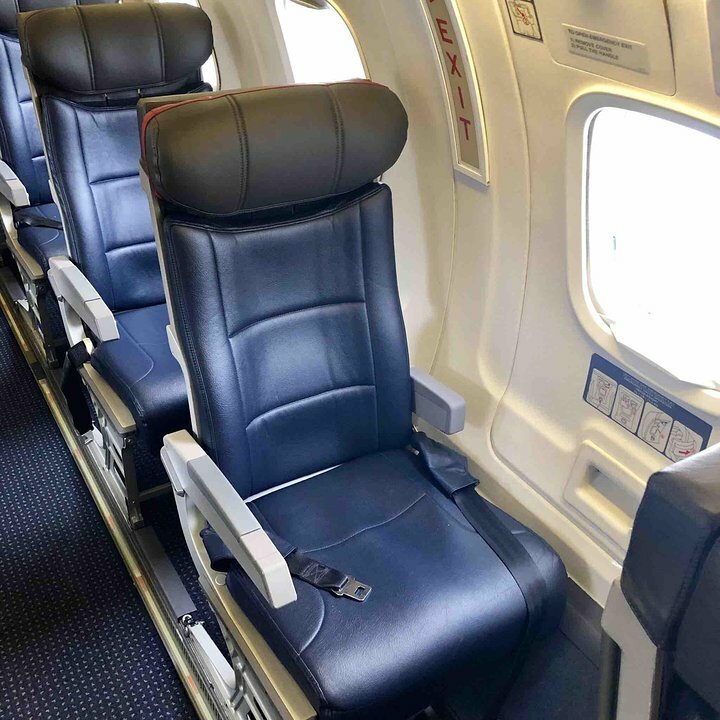 The Embraer ERJ-145 is a bit noisier and cooler than some of the larger jets but the seating is surprisingly comfortable. I always reserve a seat in row A so I can have my own space; it makes a longer flight easier for someone who's a bit claustrophobic. 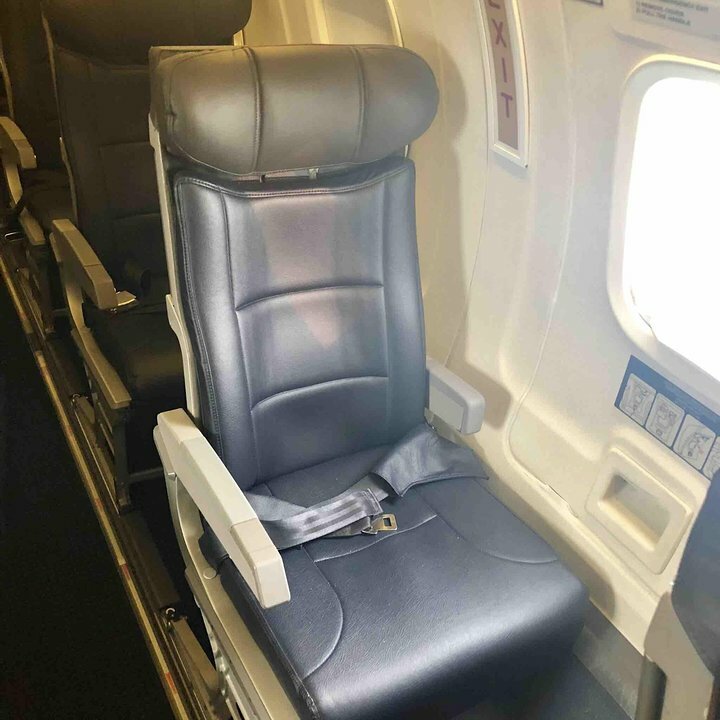 There is a piece of metal that jabs into the bottom of your left thigh due to the configuration of the arm rest connection. Nice seat - nothing special, but nice that it is both window and aisle all at the same time. Avoid this plane on any flight of one hour or more. No storage space of which to speak. Very limited recline. And no food for sale at all on this flight. Two hours thrity-eight mins. of pure hell. Shame on AA for using this plane on such a long flight. 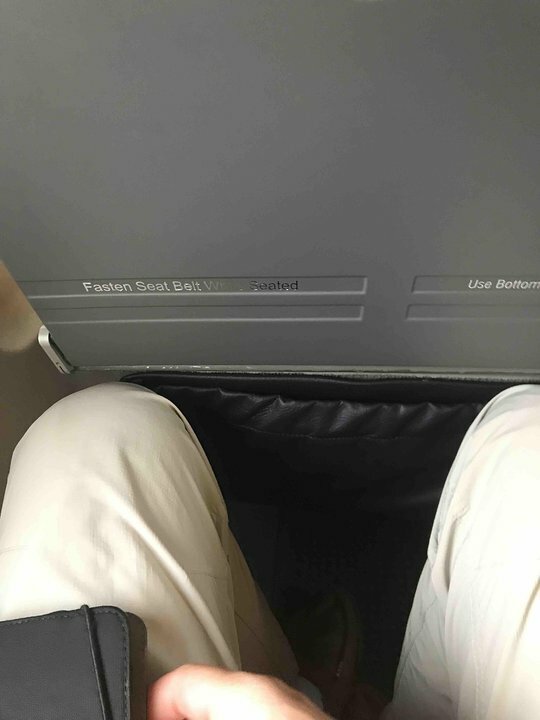 I am 6'7" and I could stretch both legs out straight under the seat in front of me, so that says something about leg room. The window armrest on the window-side is smaller but it looked attached to the seat, unlike the comment in seatguru for the seat. You have a tray table in the rightside armrest and the seat in front of you, so a choice there. On the A-side of the plane, there is NO above seat storage, so get there early, but I had no problems finding space for a backpack on both flights in this plane. While the tray table is in the armrest, the armrest is somewhat moveable. 8A is a single seat on the left, the overhead bins are on the other side but small. AA usually let you check larger carry-ons and collect at your destination. These regional jets are worked hard and may not be the cleanest later on in the day. The left hand seats on these airplanes are some of the best seats you can get on any plane, period, business class included. You get to sit by yourself. I"d much rather be on these than buried in a middle seat on an Airbus or Boeing. I ride these things all the time--San Angelo TX to Dallas, Champaign Willard to Chicago, etc. Avoid these flights at all costs! The seats are low and at a bad angle. I'm not even that tall, (5'10") but found there to be no leg room (made worse by the low seats) and limited padding on the seats. Worst airplanes I've flown in. WORST SEATS EVER! Actually, let me amend that and just say the WORST PLANE EVER! Seats are narrower than any other plane I've been on, the aisles super-narrow, and the legroom non-existent. With that said, the flight staff was awesome. This is not a plane for "fluffy" people. I'm not in favor of buying an extra seat for fluffier people in general, but this one is a must. 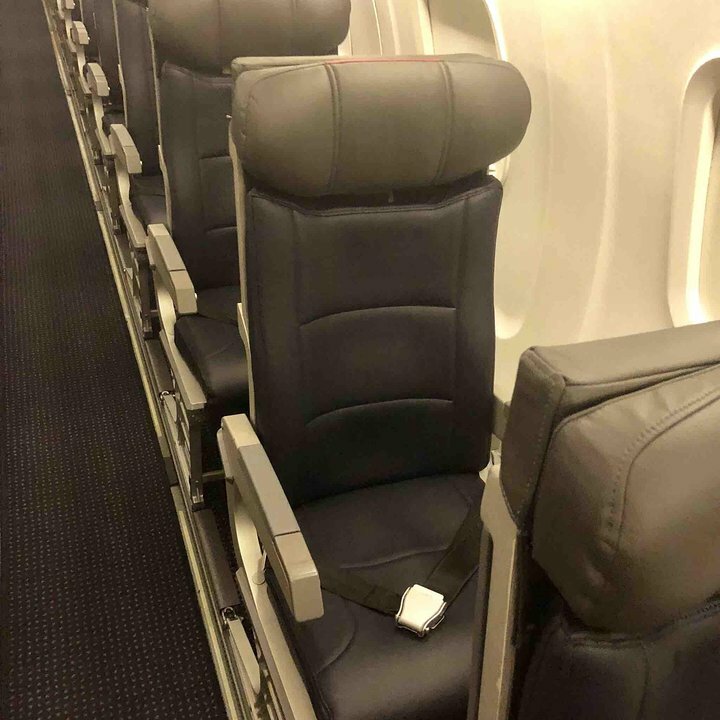 Either find a flight that has empty double seats, or buy a 2nd seat. If you need a seatbelt extender, this will not be a comfortable flight. Doable for an hour, but anything more would be miserable. This type of plan should be retired. Terribly uncomfortable. Minimal leg room, in addition to the seat being lower to the ground than most seats. As a tall (6'1") person, this meant by knees were angled up even higher than usual, and my backpack on the floor kept digging into my leg because the seat was so low. Honestly the most uncomfortable flight I recall ever enduring. Plane should not be used for flights over 90 minutes. My flights were three hours. For my STL-LGA round trip, no jetway was used for either boarding. Passengers carried luggage down stairs to tarmac and placed bags on cart...climbed stairs to board. Seats and seat pockets were dirty, soap dispenser not working in lavatory, flight attendant proclaimed coffee to be of unknown age. I have been a loyal American customer but found flights 4133 and 4129 insulting to passengers' sensibilities even in this day of uncomfortable air travel. I flew on one of these in august. The seat pitch is 31 inches. Same as a qantas 747 400 or a 380 in economy. I flew from dallas to sydney on the a380 and lax to sydney. Dallas was a 16 hour flight. Try that in seats like that. Noise is the worst thing about the erj 145, otherwise its comfortable with good windows to look out. If you are 6'5" and weight 250, try to avoid this plane. You will not be sitting down. You will be attempting to wedge yourself in. Here is another aircraft that should be banned from commercial service. I was very uncomfortable and the plane was loud. The seat would be perfect for a munchkin but not someone of my height (6'3). My knees were embedded into the seat back in front of me and for the two and half hours of flight and ground time. I couldn't wait to get off this flying sardine can when we reached ORD even though I could not stand up straight until I stepped onto the jetway. Avoid this seat at all costs. During taxiing before takeoff the loudest most unbearable noise came from this seat. I was pretty sure that my eardrum was going to burst. Avoid the entire back of the plane if you can on this miniscule airplane. I sat in 11A previously and it was a much better option. Due to the close proximity to the two doors of the plane, this seat can get very very cold. On my flight, the temp at that seat was 15+ degrees colder than the rest of the plane, so I moved. Flight attendant said this was typical for this aircraft. I liked the feel of having your own private cabin. There were a couple of downsides. It was significantly louder than the rest of the plane and it was a lot colder. I bought seat 1A, as I liked the thought of getting a few extra inches of legroom. However, the seat throughout the flight was uncomfortably cold, and loud. Having the other door across from this seat made it sound as though I was sitting next to the engine. And like others have said, cold. Even the occupant of seat 2A complained about how cold it was. This seat is particularly cold as it is next to two doors. I had cold legs throughout the flight and also found the meal tray in the armrest to be uncomfortable as it pressed down onto my lap. I fly this plane regularly from MIA to CVG. Rows 1,2 and 3 can be horribly cold especially 1. Also I don't ever get the single seat rows (A) because the storage under the seats is very limited and not big enough for a computer bag. Aisle seat (B) is the only comfortable seat. And they always valet your larger bags so make sure you have something for a computer and other valuables to take on the plane. Worst airline ever. They charge for everything and the seats are SO uncomfortable. For the "stearage" customers virtually all airlines have become sardine cans. In the grand scheme of things the little RJ145 isn't bad at all. I am 6-3 and find this far more comfortable than the "New American" fleet coming in. The new 737 is very tight and the A319 horrible. Given the choice, I'll fly the regionals--hard to believe but true. Yes, these are getting a little old. Having said that in so many ways I like these. I am a very large man, both in height and diameter. I always take one of the single side seats, put up both arm rests and am reasonably comfortable. Because there is very limited cabin storage, every company that flies these planes does the "valet" thing and puts your carry on in the baggage hold. This plane is old, but I like it. It's the only plane that has 2-1 configuration to MIA from ATL. The plane is quite loud at takeoff. Bring some headphones for takeoff. The seat was leather which was nice. There is no space for your luggage in the overhead bins for luggage so you have valet service. You drop you bag off and go on the plane. This is really nice since you do not have to lift your bag into the bin. Make sure to pick it up before you leave the gate after your arrival. 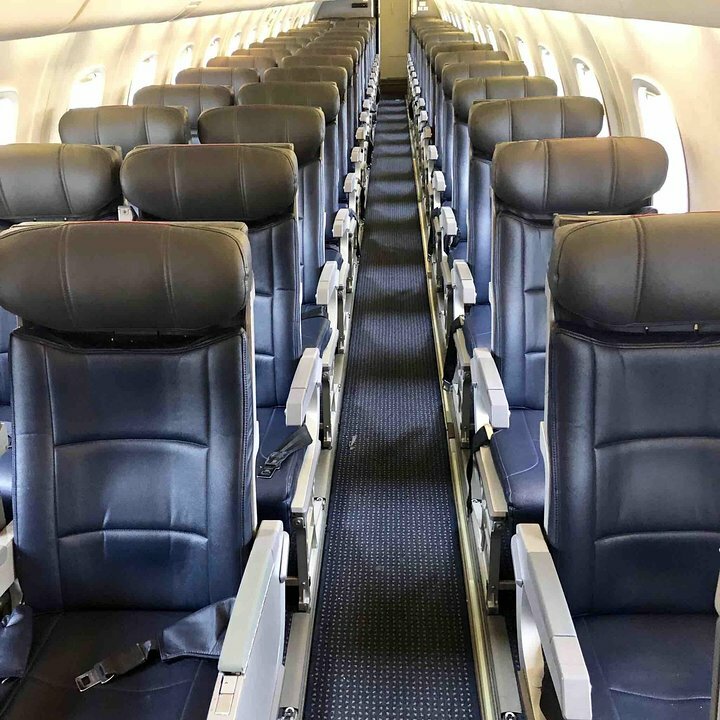 American Airlines flies 1 versions of Embraer 145 Regional Jet.